Bathroom Ideas on a Budget: 5 Design Ideas That Won't Break the Bank! Bathroom Ideas on a Budget: 5 Design Ideas That Won’t Break the Bank! A bathroom remodel doesn’t have to be expensive! Check out these 5 bathroom remodel ideas on a budget that won’t break the bank but will have your bathroom looking like a million bucks! We’ve all seen them. Many of us even have them lurking in our homes. Avocado green bathtubs. Pink wall tile. Floral linoleum. Wallpaper only a grandmother could love. Outdated bathrooms are rampant, and unfortunately few among us have the cash to drop to send in a professional for a total overhaul. Luckily, there are many options for homeowners who are looking for a budget-friendly way to update their bathroom. We’ve compiled a list of bathroom ideas on a budget. Keep reading for our five best ideas on how to give that outdated bathroom a fresh new lease on life. 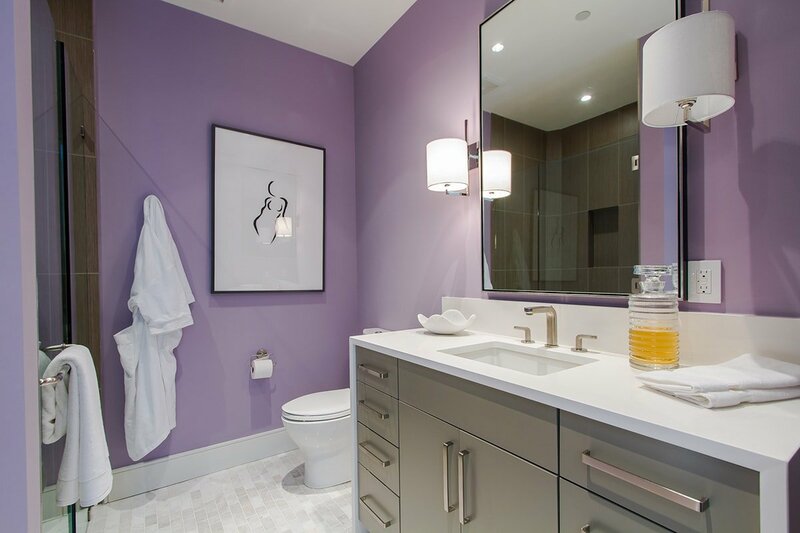 Don’t underestimate the power of paint in bringing new life to a bathroom. A coat of fresh paint on bathroom walls, trim, and even the ceiling is an inexpensive way to make a huge difference in the look and feel of a bathroom. Consider bright colors like cheery greens or yellows to freshen up an older bath. Subdued blues make for a luxurious spa-like atmosphere right at home. Dark, unexpected colors like navy or Bordeaux make a bold statement. To save on paint costs, there are a few options. First, consider painting just an accent wall. This adds visual interest to the room for a fraction of the cost of painting the whole space. Second, swing by the paint section of the hardware store and ask if they have any mis-tinted paint — they’ll generally sell it at a deep discount. Painting is a great DIY project that can be knocked out in a weekend with the right equipment and some elbow grease. When shopping for supplies, remember the painter’s tape and tarps to avoid getting paint on fixtures, vents, and lighting. 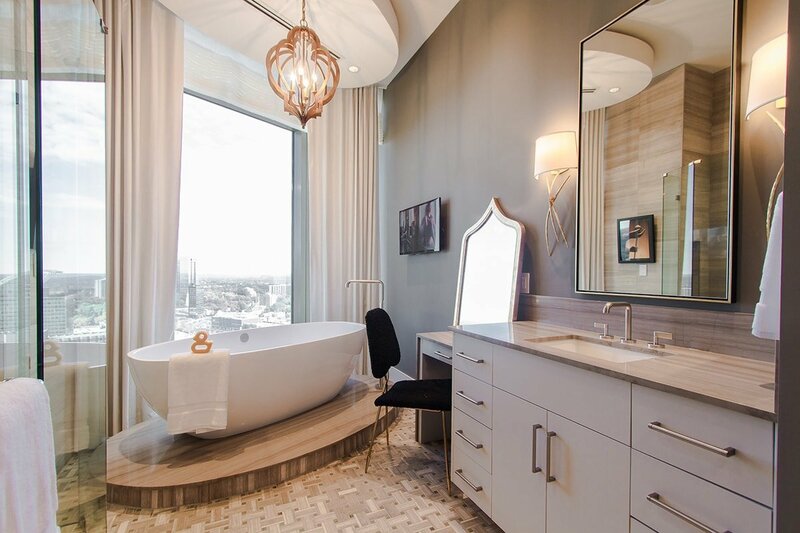 If the plumbing, lighting, and fixtures in your bath are all in working order, avoid replacing them and explore less expensive options instead. Tubs can be refinished or reglazed for a fraction of the cost of replacement. This refinishing can be done on cast-iron, steel, or fiberglass tubs, and the color can be updated when refinishing (bye, pink tub!). A well-done bathtub refinish can last up to 15 years! Re-grouting old tiles is a simple (if not tedious) way to freshen up the room and give your tile floor or surround a fresh, clean look. Outdated tile floors can be painted with specialized paint and primer. Large floor stencils are available, too. Try making an impact with a bold, stenciled floor that will give your entire bathroom a unique look. If the flooring needs to be replaced, consider a stone- or wood-look vinyl. Vinyl bathroom flooring can be an affordable, durable alternative and is generally easy to install. Update hardware on drawers or cabinets for a quick and easy refresh. Shop vintage pieces on online auction sites or at estate sales for great deals on one-of-a-kind pieces. Faucets and other bathroom fixtures can be refinished with a lacquer to completely change their look (oil rubbed bronze, anyone?). You’ll get the look of brand new fixtures, but it won’t add much to the cost of the bathroom upgrades. 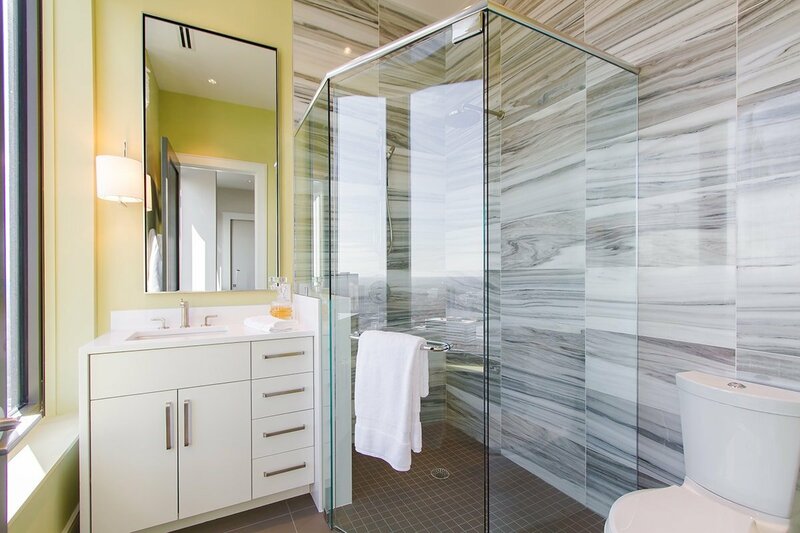 It’s unavoidable — the more expensive elements of a bathroom will occasionally need replacement. If this is the case, look to buy pre-owned pieces. Secondhand shops, internet reseller sites, auctions, and online “garage sales” are all great places to find gently used budget bathroom fixtures. Look to buy tubs, vanities, mirrors, light fixtures, hardware, and more this way. Some appliance and home improvement stores will sell floor models, customer returns, or “scratch-and-dent” items at a discount. Call around and find the deals! There is a lot that can be DIY’ed when doing a simple budget bathroom makeover. Painting, refinishing, even simple plumbing repairs or upgrades can generally be done without a professional. Utilize the internet to look for helpful how-to articles and step-by-step videos. Call on friends and family members that have done their own remodelling projects for advice and assistance. Where practical, use time instead of money to redo what’s already there. Have an older vanity that’s in good shape but needs a facelift? Sand, prime, paint, and replace the hardware for a brand new look. Re-grout tubs and tile. Lay a new laminate floor. Paint the walls or ceiling. It’s amazing what can be done with some effort and a helpful YouTube video! 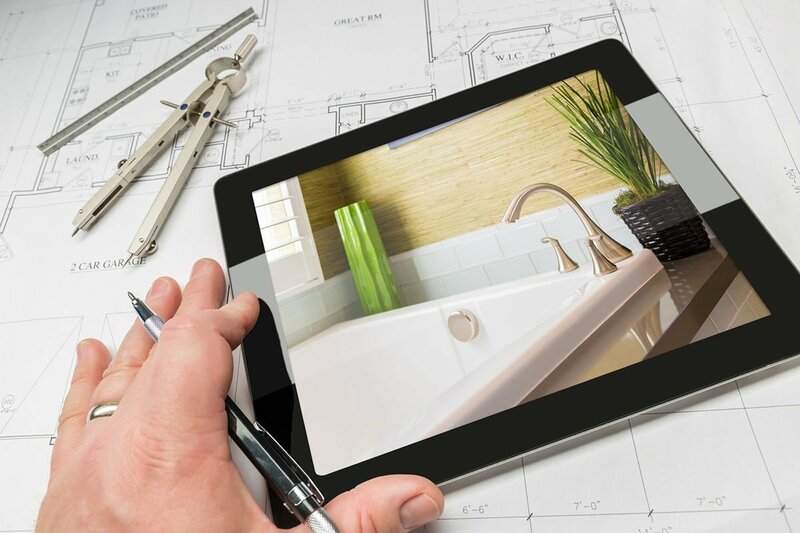 There are creative ways to add interest and value to a bathroom during a remodel, and they don’t need to break the bank. We mentioned the floor stencil above, but stencils can also be used on wall tiles for a low-cost accent. Snag an old dresser at a secondhand shop, refinish it in a fun color, and use it as a vanity for the bathroom sink. Wallpaper is coming back into style, too — but use it in a unique way! HomeRenoCare has a great blog on adding style to your bathroom with wallpaper, and they suggest papering the ceiling instead of the walls for unexpected visual interest. Houseplants are a great, inexpensive way to decorate a bathroom. Choose plants that can tolerate low light and high humidity, like aloe vera, Boston ferns, or dracaena. Hang them in unique places like the shower for a spa-like atmosphere. Use a leftover pipe or plumbing parts to create unique and inexpensive towel racks and hooks. A wall-mounted wine bottle rack makes a perfect shelf for rolled up bath towels! 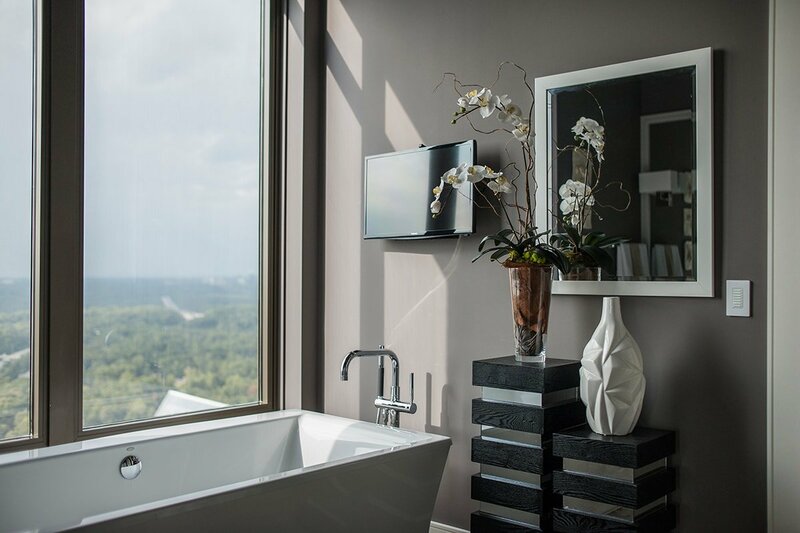 The internet will be your friend for your budget bathroom makeover, so take advantage of decor websites and blogs to get your creative decor juices flowing. 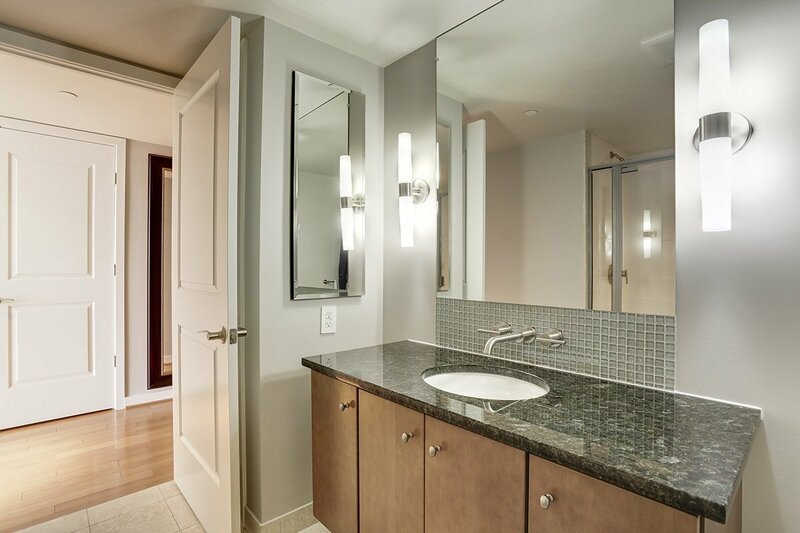 Getting a fresh, new bathroom doesn’t need to break the bank. There are more than enough bathroom ideas on a budget to help homeowners escape the 70s (or 80s, or 90s!). Stay tuned into our interior decorating blog for great decorating tips, guides, and more! Soon, your whole house will look as great as your bathroom. Great ideas for my house, it needs updating, and this is just the help I need.